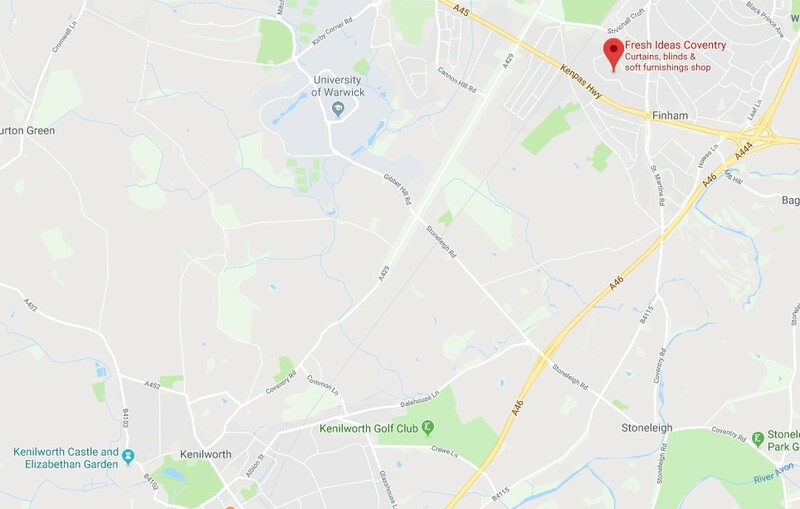 If you’re looking for a professional soft furnishings company to supply & fit your new home décor in Kenilworth, then look no further. Here at Fresh Ideas, we have been supplying Warwickshire quality soft furnishings since 1988. We offer made to measure curtains, made to measure blinds, wallpapers & carpets, to name a few of our products – all of which we can help you choose and coordinate together saving you the hassle of going to several shops. Our team within Fresh Ideas are experienced and will help guide you through our large selection of curtain fabrics & blinds to coordinating curtain poles & patio awnings. In our showroom you can browse through the thousands of samples we have, and when you’ve got a shortlist to help you decide you can borrow the samples to view them within the comfort of your own home. We offer a full measuring and fitting service, including a carpet uplift and furniture moving service to help take the stress out of choosing your new furnishings. With free parking right outside our showroom and open each day except Sunday, we believe that you’ll be glad to visit us.